Dawn Aldrich ~ Author & Blogger: Do You Believe? Hearing God's voice in the stillness of our hearts is a promise we have if we truly seek his face. When we know God is leading us into something it takes courage to take those first few steps toward that journey but eventually our stride meets up with God's pace and we're moving in sync with Him. We find ourselves in the middle of some exciting journey and the world is full of possibilities and opportunities. Suddenly, there's a bump in the road and we hit it hard. It came out of nowhere and we're thrown off course, dazed a bit, confused and once we come to we wonder if we were just dreaming. Now there's an emergency that's taken our attention and people are crowding our path in all directions. Sitting in the midst of all the confusion, we wonder, "Did God really mean for me to take this road? Was I just talking to myself or was it really God at all?" 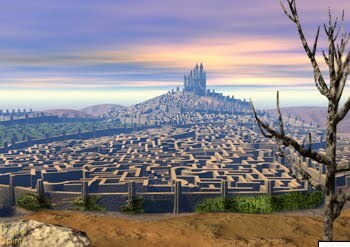 I'll admit following God's lead in my life is sometimes like finding my way through a labyrinth while blindfolded. I hear His voice. I'm convinced I'm going in the right direction but I keep hitting a brick wall. But, just like in a labyrinth, if I keep on course, following God's voice I'll eventually succeed in finishing the journey to the end. Preparing for this Christmas season today, I've started to move through an Advent devotional. It focused on Mary's faith. The story says she "simply" opened her life to the Lord as his handmaiden in obedience to the angel Gabrielle's message to be the mother of Jesus. But, I've no doubt her journey in the next 9 months was not smooth going. I would think amongst the ridicule and embarrassment of her illegitimate pregnancy she thought more than once if she was following the right path; wondered if she should be the chosen one of God to carry his child. What was she thinking? Life would have been so much easier if she said no and just went about her business as Joseph's betrothed. Thank goodness for Mary's belief; her faith that the words God spoke to her were true. Where would we all be if Mary hadn't believed to the end? Has God asked you to step out in unspeakable faith toward a journey that seems impossible? Are you in the midst of a faith journey that has hit a few bumps and you're wondering if God's words were really true? Are you questioning God's ability to accomplish great things through you? Let's take today to reflect on Mary's 9 month journey towards Jesus' birth . When we think our journey is rough, when we start to question God's work in our lives let's hang on one more day and walk a little longer on the path guided by his voice. He will accomplish all that he has said. He is God. He is the great I am!.